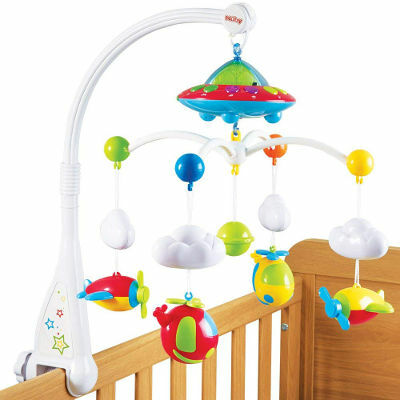 Help your baby have a restful nights sleep with one of these must-have mobiles from the Amazon bestseller lists. 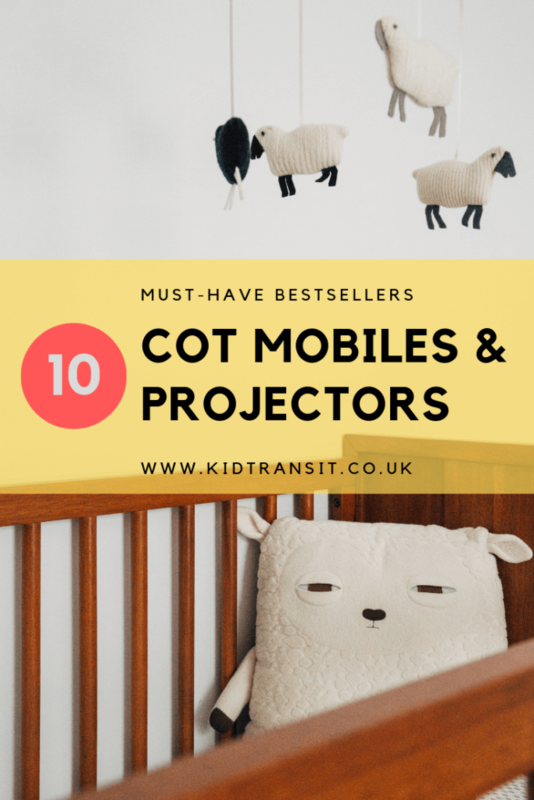 When you’re trying to soothe your baby at night or for a daytime nap, a cute cot mobile or projector can really help. Some play musical tunes, some have light displays to twinkle on the screen and some will gently rotate to keep your child entertained. 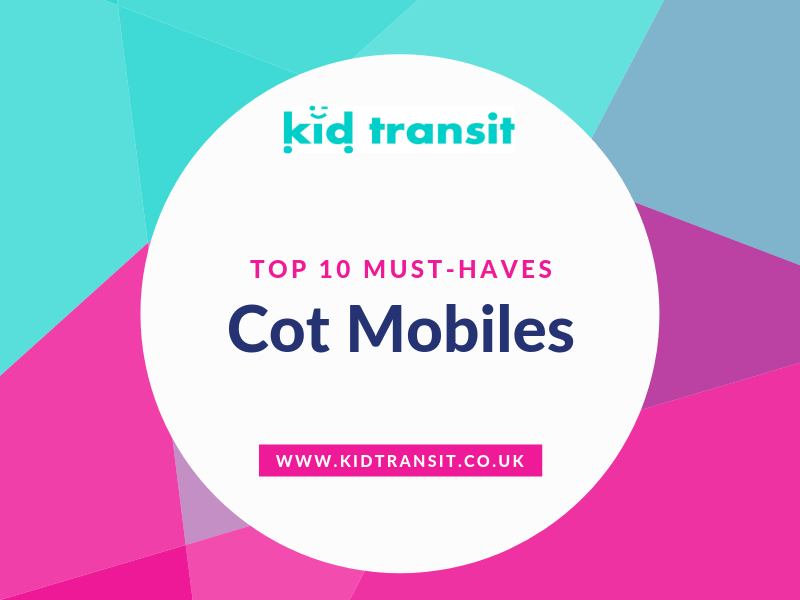 Our top 10 also includes travel versions so their favourite mobile can go with them when you visit friends and relatives or go away on holiday. 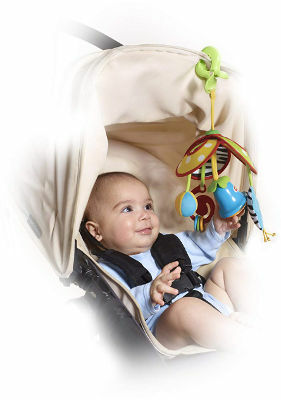 Some of the mobiles are also easy to pop on a pram or pushchair so your baby is entertained and soothed when on the move. 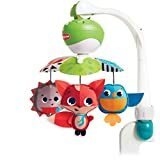 This cute and bright mobile can be easily clipped on to a cot, activity mat, baby carrier, stroller, bassinet, in fact wherever you place your baby, you can attach this mobile. The plush animals rotate and five different melodies can be chosen to stimulate your baby so you can take five minutes rest. 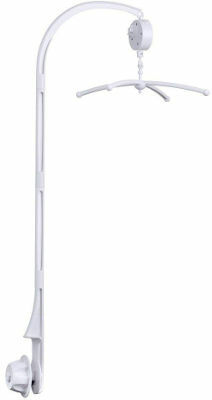 This substantial cot mobile has loads of extras to entertain and soothe your child depending on which settings you use. The fun aeroplanes and helicopters can be set to turn in time to over 18 minutes of lullabies. There’s also a colour changing star and moon projection for the ceiling or wall so your baby can watch the colours glowing as they drift off to sleep. The mobile clips securely to the side of the cot and uses batteries so no trailing cords. 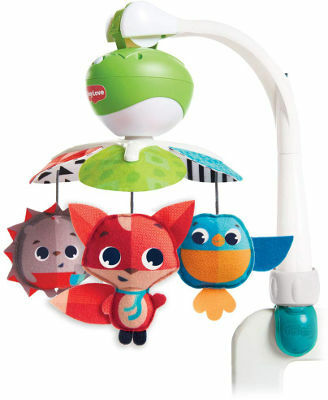 From one of the market leaders in childcare products, this musical mobile from Mothercare is stylish and practical. The pale, calming colours of the mobile will grace any nursery decor and the soft hanging toys will be safe for your little one to grab. The music is provided by a wind-up music box so there’s no need for batteries. As you would expect from the name, this is a smaller mobile that you can easily take with you on your pram or pushchair. 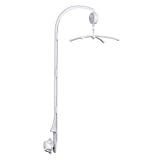 The hanging toys neatly fold up into the hanging loops making it easy and compact to carry. 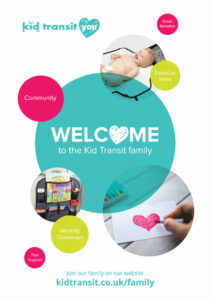 The toys are a mix of tactile and noise making so your baby can develop different skills. 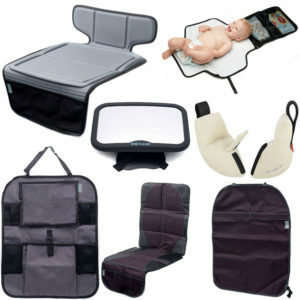 The sturdy clip will easily fit onto carrycots, travel cots and prams. 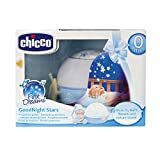 This one isn’t a mobile but it deserves a mention as it is a lovely toy to help your baby or toddler drift off to sleep. The nightlight has a star projector to create constellations on the ceiling and the music is a combination of classical tunes (Bach and Rossini) as well as nature noises. The nightlight also comes with a little plush that can be cuddled in bed. 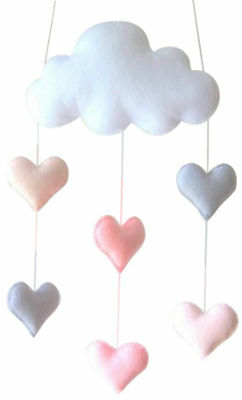 This is a classic mobile, it has no sounds or lights but it is such a pretty design that it will enhance most nurseries. The mobile hangs easily from the ceiling or on a hook. 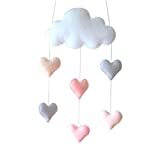 The cute design with a big cloud and little hearts cascading from it has a homemade vibe about it that is on trend. Make sure you check the dimensions as some buyers have been surprised by the size! 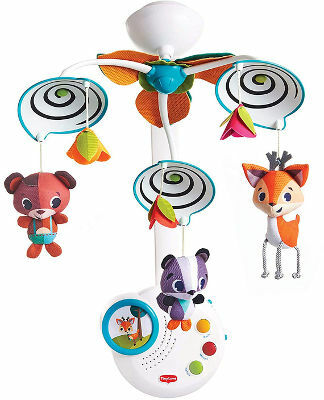 Another brilliant mobile from Tiny Love, this one is their classic design but that doesn’t mean you don’t get a really fun, musical mobile. 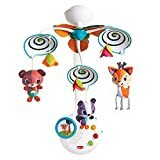 The hanging animals are cute and engaging for little hands and the spiral discs are especially stimulating for small babies with their black and white pattern. 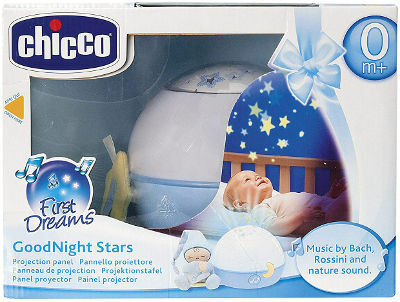 The music box can also be removed and used as a standalone toy when your baby is older. 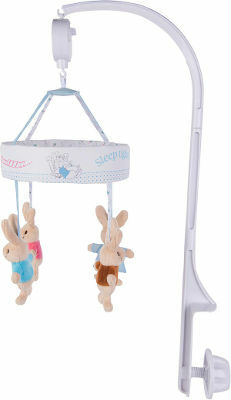 A beautiful and classic cot mobile with the ever popular Peter Rabbit as it’s inspiration. 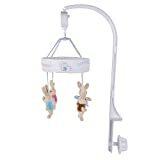 The mobile has four characters- Peter Rabbit, Flopsy Bunny, Benjamin Bunny and Cotton Tail hanging from the rotating music box. The music box is a wind-up version and so doesn’t need any batteries. 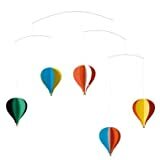 If you are feeling crafty or have some great hanging toys that you think will make a perfect mobile, take a look at this mobile holder. You get the apparatus to fix the mobile to a crib or cot as well as the music box and the holder to attach your own hanging toys. 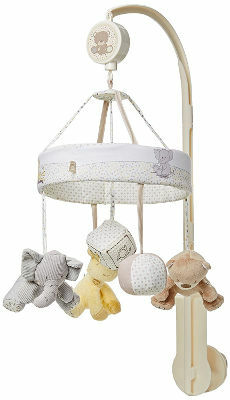 A great idea if you want your baby’s mobile to complement their room scheme or feature their favourite toys. 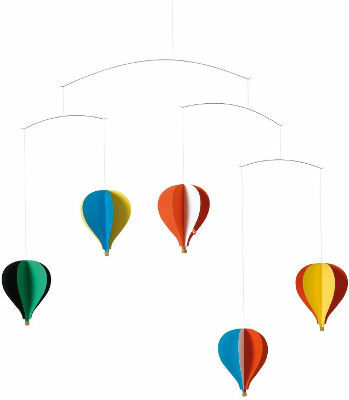 If you want a really contemporary mobile for your child’s room then this hot air balloon might be the one for you. The simple shapes and complementary bright colours make this mobile stand out as sleek as well as fun. Even looking this stylish, the mobile will also stimulate your baby with the high contrast colours proving irresistible.